Includes an early map of Singapore Island and city as an inset. 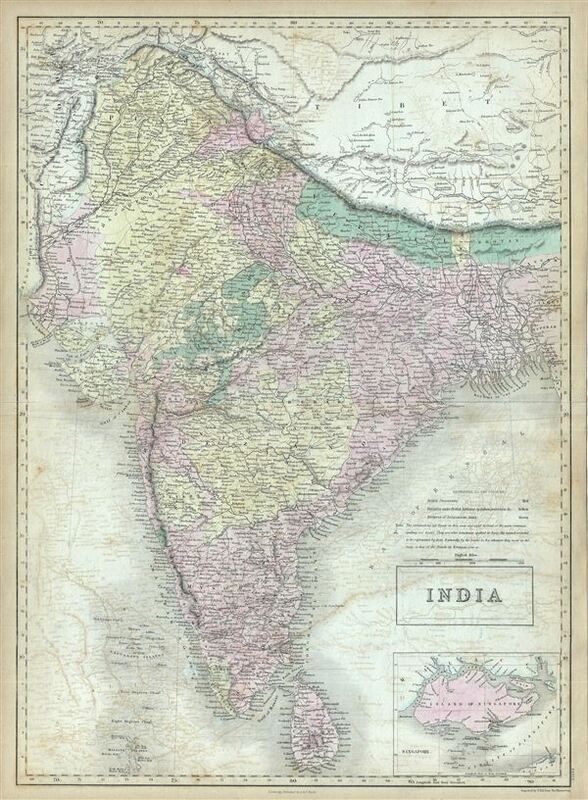 This is a fine example of the Adam and Charles Black's 1851 map of India. It covers the Indian subcontinent from the Indian Caucasus Mountains to the Indian Ocean and includes Ceylon or Sri Lanka and part of Kabul in Afghanistan. The map is color coded according to territories under British Possession, territories under British influence by tribute protection and independent states. This map's large inset of Singapore Island, in the lower right quadrant, is of particular interest. Like India, Singapore was administered by the British east India Company and, largely due to the opening of the Chinese market, was rapidly rising to dominate regional shipping. The map identifies the city of Singapore, the hospital, the european settlement, mercantile yards, the powder magazine, battery, and the sultan's mosque. This is one of the earliest maps to offer a specific detail of Singapore Island that we have encountered. At the same time, the Indian subcontinent was ruled by the British east India Company. The newly appointed Governor General, Lord Dalhousie brought along several progressive changes including education, railways, canals, telegraph etc. At the same time dissatisfaction with the east India Company was rapidly growing. In 1857, the sepoys of the British east Indian Company would revolt in India's First War of Independence. This ultimately led to the dissolution of the east India Company. Subsequently governance of India was administered directly by the British Crown. The British Raj ruled India until its independence in 1947. Various towns, cities, rivers, mountains, islands and several other topographical details are noted with relief show in hachures. This map was engraved by Sidney Hall and issued as plate no. XXXIX in the 1851 edition of Black's General Atlas of the World. Very good. Minor overall toning. Blank on verso. Offestting. Verso repair on original centerfold.